President Barack Obama speaks during a joint news conference with Mexico's President Enrique Pena Nieto in Mexico City, Thursday, May 2, 2013. President Barack Obama was in Costa Rica on Friday to prod Central American leaders to tackle and move past the drug battles and violence that have defined their relationships with Washington. He held a joint press conference with Costa Rican President Laura Chinchilla on Friday evening, hours after he gave a speech in Mexico City in which he cast Mexico as a nation ready to take "its rightful place in the world" and move past drug battles and violence as well. Obama's three-day visit to Mexico and Costa Rica is his first to Latin America since winning a second presidential term in an election in which he gained the support of Hispanic Americans by a large margin. His trip is being followed with great interest by Hispanics in the U.S. as well as in Mexico, Central America and farther to the south. In Mexico in particular, he tried to set a new course for ties between the U.S. and its southern neighbor, eagerly promoting Mexico's improving economy and its democracy. "A new Mexico is emerging," Obama told a crowd of young people during a speech at Mexico City's grand National Museum of Anthropology. "Mexico is also taking its rightful place in the world, on the world stage. Mexico is standing up for democracy not just here in Mexico but throughout the hemisphere. Mexico's sharing expertise with neighbors across the Americas. When they face earthquakes or threats to their citizens or go to the polls to cast their votes, Mexico is there helping its neighbors." 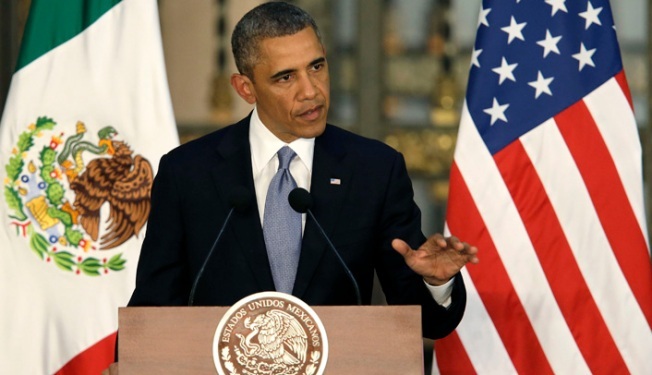 Despite Obama's rosy portrayal, Mexico's high poverty rates have barely budged in recent years. Its economy grew by only about a 1 percent rate in the first three months of 2013 and is not creating anywhere near the 1 million jobs annually it needs to employ young Mexicans entering the workforce. Without jobs or opportunities to study, many young people have become easier prey for recruitment by drug cartels. The president conceded his own country's role in the troubles that have plagued Mexico, acknowledging that most guns used to commit crime in the country come from north of the border. A key cause for Mexico's violence is the demand for illegal drugs in the U.S., Obama said, though he reiterated his opposition to legalization of such drugs, which some Latin American leaders have called for. Still, the president pressed for the U.S. and Mexico to move beyond the "old stereotypes" of Mexico as a nation consumed by sensational violence and of the U.S. as a nation that seeks to impose itself on Mexico's sovereignty. "In this relationship, there's no senior partner or junior partner," he said. "We are two equal partners." The president has a domestic political incentive for trying to change America's perception of Mexico. As Washington debates overhauling the nation's immigration laws, Obama is seeking to convince the public and lawmakers that Mexico no longer poses the illegal immigration threat it once did. While the prospects for immigration overhaul by Congress remain uncertain, the president said he was optimistic the U.S. will change its patchwork laws this year. With about 6 million Mexicans illegally in the United States, the issue resonates deeply in Mexico, which has also seen deportations of its citizens from the U.S. rise dramatically under Obama. Obama sought to link his push for more economic development in Mexico with the immigration debate, saying, "The long-term solution to the challenge of illegal immigration is a growing and prosperous Mexico that creates more jobs and opportunities for young people here." From Mexico, Obama headed to Costa Rica. He arrived in the capital of San Jose on a rainy afternoon but received a warm welcome from thousands of Costa Ricans who lined the road near the airport. Some waved American flags. Others held homemade signs, including one that said "Fired Up!" — a reference to his campaign slogan — in a much more demonstrative welcome than he had received in Mexico. Obama had meetings and a joint news conference scheduled with President Laura Chinchilla, who is serving as chair of the regional Central American Integration system. The network also includes the leaders of Belize, El Salvador, Guatemala, Honduras, Nicaragua and Panama. Obama is expected to take a more forceful tone with regional leaders than he did with Mexico's new president, Enrique Pena Nieto, whom he praised for bold reforms. The U.S. sees Central America's violence and security weaknesses as holding back economic growth in the region. And with fewer Mexicans crossing the U.S. border illegally, the rest of Central America has become the main source of illegal immigration into the United States. Central American leaders see drug consumption in the U.S. as a driving factor in their security issues, and many of them want the U.S. to take more responsibility in the fight against drug cartels. But the regional group Obama was meeting with on Friday — known as SICA for its initials in Spanish — is often divided by rivalries among its members. Guatemala and Belize have their own border dispute. Honduras and El Salvador are fighting over the use of the waters and shores of the Gulf of Fonseca, and a conflict between Nicaragua and Costa Rica over the San Juan River border has been escalating. Obama will speak to business leaders on Saturday before returning to Washington.